Millennials have been typecast as lazy, entitled and unwilling to work -- but the rate at which these young professionals burn out suggests otherwise. According to the American Psychology Association, 39 percent of millennials say their stress increased last year, 52 percent report lying awake at night from stress at some point in the past month and 44 percent report feeling irritability or anger because of their stress. James Goodnow, attorney at Fennemore Craig, P.C., dubbed "America's Techiest Lawyer," is known for his quick rise in the business world as a millennial. He's spoken extensively on the topic of millennials at work, and has insights into why this generation is burning out. Goodnow says he sees a trend with millennials where they're simply "driven by different goals than workers from other generations." Millennials are often creating their own businesses on the side, volunteering on social matters and fostering personal hobbies and activities to promote personal growth, which leaves them with little time left over for self-care. They're simply stretched too thin, says Goodnow, and when you combine that with the growing financial pressure on this generation, a full-time job only "exacerbates this and can contribute to burnout." This stressed-out and anxious generation is bad news for employers, as a study from Besinger, DuPont & Associates found that millennials are more likely to miss work. Unlike older generations that value "visibility at work," millennials seem more likely to take a day off or call in sick if they're feeling overwhelmed and anxious, according to the research. The study also uncovered an epidemic around "presenteeism," which means working while sick, or anxious, only expediting the path to burnout. If your millennial workers are stressed, anxious and burnt out that means that even when they show up to work, it's likely that they are disengaged, checked out and underperforming as a result. But there are ways you can help support your stressed-out workers, even if you think they've already reached the burnout stage. For instance, Goodnow suggests a flexible work arrangement -- and while he notes it's something that's been "written about ad nauseam," this simple fix really can help. In fact, one study on millennials from Workplace Insights found that 85 percent said they wished to work remote full-time. Even if you can't provide a full-time remote schedule for workers, you can always institute more flexible hours -- some workers might want to work earlier or later schedules in order to fit other activities and passions into their days. And you can always opt to give employees the freedom to work from home for part of the week, or let them escape the office for a few hours during the day to go work in a different environment. Goodnow also suggests considering giving your millennial workers new and interesting projects that might be outside their normal day-to-day tasks. For some workers, they might simply be bored from the monotony and shaking things up can "help them feel refreshed and motivated," he says. 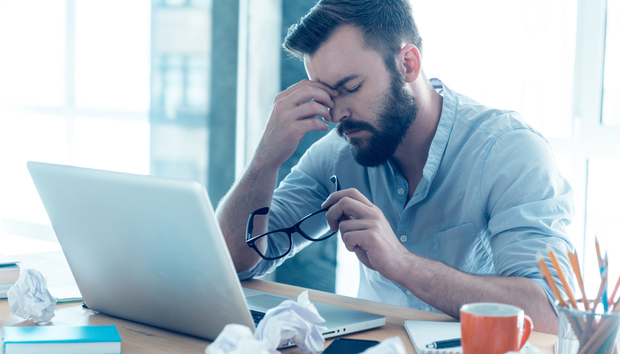 Jayne Mattson, senior vice president at Keystone Associates, an outplacement and career coaching service, says that sometimes preventing or combating burnout is fostering healthy professional relationships with your employees. "You can begin to see warning signs of how people behave when stressed and headed for burnout. Managers need to care about their employees and what is going on in their lives -- in a friendly, not intrusive way. By asking 'how was your weekend, do you have any fun plans for the weekend or vacation' can trigger a conversation for the manager to hear if they working too much or not taking their vacation," she says. And ultimately, she says, managers and executives need to set the example in order to "give credibility to supporting the workplace culture and show the employees the company cares for their well-being." Embrace a culture that encourages getting away from your desk, taking time off and utilizing all the benefits the company has to offer. While plenty of studies show that millennials want what most other generations want from work -- stability, good benefits and fair compensation -- managers still might find their youngest workers more difficult to relate to. "The tendency of millennials to take on responsibility in many areas, including outside of the work environment, may be foreign to supervisors from other generations. Businesses should train managers to understand that millennials may in some cases be busier outside of the office than workers from other generations," says Goodnow. Mattson also points to the growing pressures on millennials -- pressures that prior generations didn't have to deal with. "The cost of education is much higher, so they are starting jobs owing a lot of money. When the reality sets in of how long it will take to pay off loans, it prevents them from doing things they want to do, which may be living in the city, traveling or purchasing trendy items," she says. That means, managers might need to be trained on the "millennial mindset" to better understand that their younger employees are most likely stressed about things other than climbing the corporate ladder. It's more important than ever for supervisors and managers to understand the mounting pressures weighing on millennials, says Goodnow. This generation saw their parents and grandparents lose big during the crash of 2008, says Goodnow; they've also witnessed foreclosures and struggle to find affordable housing while digging out of massive student loans amid skyrocketing housing costs. It's also driven millennials to care deeply about the world around them -- and that sense of purpose extends to their careers as well. Businesses should help their employees feel as though what they do matters, and help them see the direct impact of their work. "If your business is invested in important causes, it allows millennials to fulfill their desire to make the world a little better every day they work. This is a profound non-economic benefit that can impact retention of your millennials workers," he says. Pat Hume, chief commercial officer of iPass, a company that focuses on providing wireless connectivity solutions to support mobile workers, also recognizes the differences in managing millennials. He points to their education and the fact that they are prepared for challenging work, even when they're entry-level. "There are a few things to keep in mind when managing millennials. They are the most educated generation in history and tend to enter the workforce with a greater sense of mission and purpose. So reinforcing that sense of mission is important, as well as offering creative and exciting projects when possible," he says. And if you don't know where to find meaning in your business, Goodnow says you should step back and let the millennial workers show you. Give them the freedom to come together and figure out ways to help better their community or give back, and then act on it. "By taking this step, you will show millennials workers that you trust them, you support them and you're with them. It just so happens that this might be a great way to train future leaders, as well," says Goodnow.